is a component of ZebraLab and allows the automated observation and tracking of larvae zebrafish and zebrafish embryos. The Zebrabox is the first ever high-throughput monitoring enclosure to analyze zebrafish behaviors. The 4th generation of ZebraBox is the result of 15 years of close collaboration and development with zebrafish researchers. 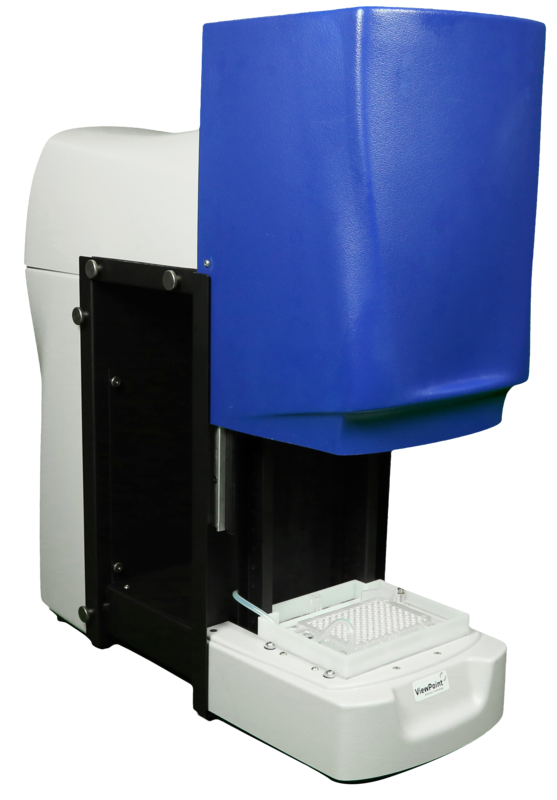 It is a complete system, designed for the high-throughput analysis of zebrafish larvae in multi-well plates with a total control over the experiment environment. ZebraBox can revolutionize your research thanks to its scalability : several ZebraBox can be installed in parallel, allowing to track even more zebrafish with each ZebraLab system. High-throughput analysis is at your fingertips with this state-of-the-art system from ViewPoint. Versatility and reproducibility are important : ZebraBox is flexible enough to accommodate various protocols using 6, 12, 24, 48 and 96-well plates. Integrated illumination, including infrared, and water flow system provide fully standardized experimental conditions. Long-term monitoring without compromising environmental conditions are within the realm of possibility with ZebraBox. Controlling the abiotic factors and experiment conditions has always been our main concern. More than 10 years of constant development of the ZebraBox lead to the best zebrafish behavior enclosure available on the market. External factors can greatly influence behaviors of the fish, and this is why the ZebraBox allows a total control over those factors. Double Anti-vibration systems : The ZebraBox feet and the microplate analysis area are mounted on patented anti-vibration systems, eliminating all external vibration sources (subway, road, people walking by, and other apparatus on the table…). Cold Light Control : The ZebraBox lighting system is heat-free. Unlike other systems needing the water flow to cool down the apparatus, the ZebraBox do not heat up, even on very long experiments. Strong light Stimulation : The ZebraBox white light can be controlled very accurately over 100 different intensity levels. Once the ZebraBox door is closed, subjects are sealed in totally dark conditions, all the outside light is blocked from entering the equipment allowing total light control. Simulate day-night transitions for circadian cycle studies, trigger series of flash, create any light sequence you can think of and be in total control of the light conditions. Direct Observation technology : The ZebraBox provides direct access and observation of the subjects at all time, offering the best image quality. Based on NASA mirror technology, the ZebraBox is not limited in resolution, unlike lens or other objects on top of the experimenting area which could cause image distortion, water condensation or interfere with the animal behavior. Soundproof : The special alloy of which the ZebraBox is made restricts external sounds from disturbing the analyzed subjects. Moreover, many add-ons are available in order to fit your researches such as the fast camera, customizable top lighting for PhotoMotor Response or Optogenetic, shocker module, vibration module and temperature control unit, check them out !